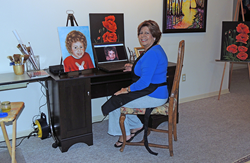 Vocational Rehabilitation shares a success story in honor of Anxiety and Depression Awareness Month of an artist who found her true passion and opened her own art studio. Barbara DeRuiz in her home art studio. Barbara is a self-starter for sure. She just keeps getting better and better with every piece of artwork that she shows me. Walking through Barbara DeRuiz’s house, you can’t help but notice the beautiful paintings on the walls – portraits, landscapes, and abstract designs. And when you look at the signature at the bottom of the paintings, you notice that they were all created by Barbara herself, and they are stunning. Barbara, who has a disability, is a newly commissioned artist who started her own business with the help of Vocational Rehabilitation (VR). VR helps people with disabilities find or keep a job. Barbara started working with Martin Zients, of The Management, to create a business plan for her new venture. VR also provided office equipment, art classes, supplies, and a show tent to help her be successful. Barbara started receiving commissions for individual portraits. Although she enjoys painting portraits, Barbara’s plan was to travel to area art shows to sell her paintings, and she realized that abstract works would be more popular.